Smith Haj Publishing Group, Inc. The New York Beacon is an African-American weekly providing coverage for the five boroughs of New York City and the surrounding counties. Our mission is to educate and entertain our audience and to promote their efforts and activities. The publication is a family-oriented newspaper reaching all economic segments of the African-American community. Established in 1975, The Beacon has continuously strived to service its advertisers by exposing their goods and services to its readership. The Beacon is sought after for its hard-hitting editorials and pictorial presentation of local news, sports and social events. The Wahpeton Daily News is a local paper distributed in Wahpeton, North Dakota. The Daily News serves Richland County, North Dakota and Wilkin County, Minnesota, including Wahpeton and Breckenridge, Minnesota, which are nestled at the base of the Red River of the North on the North Dakota-Minnesota border. Features include arts, entertainment, community, sports and more. Correctional News magazine covers the planning, design, construction, maintenance and operations of corrections facilities in the United States. This magazine is free to qualified subscribers. Data isn't the same as information. You can tell potential advertisers that your readership is 10,000, the average household income is $75,000 and your CPM is $12. But unless you put that data into context, you won't be able turn it into information that your advertisers can understand and act on. Your goal is to bridge the gap between data and understanding. Information only sells when it meets a client's needs. Hard data should only be part of the story. For example, your publication reaches 10,000 readers, but 75% fall into your advertiser's target demographic. Your competitor also reaches 10,000 readers, but only 40% of their readers fall into the advertiser's target demographic. Different magazine audiences have different attitudes toward the economy, according to Affinity and Experian Simmons, which surveyed readers of various titles to discover their feelings about the future for the Affinity AMS / Experian Simmons magazine database, which combines print and digital magazine audience estimates from Affinity's American Magazine Study with consumer insights from the Simmons National Consumer Study. Overall, Affinity and Simmons found that when it comes to opinions about the economy, U.S. adults are divided roughly into thirds, with 32% believing that economic conditions will worsen over the next year, 38% predicting no significant change in the nation's economic health over the same period, and 30% expressing optimism that America's economy will be better off one year from now. However, these proportions varied quite a bit when Affinity and Simmons took a closer look at the attitudes of different magazine audiences, in both print and online. Interestingly, the highest proportions of optimists on the print side – meaning print readers who said they believe the economy will be better a year from now – were found in the audiences for African-American-interest magazines, including Essence, where 50% agreed, Ebony (46%), Jet (44%) and Black Enterprise (42%). Also scoring relatively high in optimism were readers of Elle Decor (43%) and the audiences for New York Magazine, Men's Journal, Life & Style Weekly, Tennis and Veranda, which scored 39% across the board. Among magazine website visitors, the most optimistic audiences were found at Bridal Guide (55%), Harvard Business Review (49%), Dwell (48%), and Outside, Bicycling and Parenting (46% each). Also scoring higher than average on the optimism index were online readers for Car Craft, Organic Gardening, Black Enterprise and Traditional Home (45% each). The most optimistic mobile audiences for magazines seemed to be dominated by women: 45% of Lucky's mobile readers said they believe the economy will be better a year from now, followed by Allure (43%), Seventeen (42%) and Fitness (42%). According to a study conducted by the Pew Research Center's Project for Excellence in Journalism, in collaboration with The Economist Group, 77% of tablet owners use their tablet every day. They spend an average of about 90 minutes on them. Eighteen months after the introduction of the iPad, 11% of U.S. adults now own a tablet computer of some kind. 53% get news on their tablet every day, and a majority says they would not be willing to pay for news content on these devices. The only activity that people said they were more likely to do on their tablet computer daily is browse the web generally (67%). More than two-thirds (68%) of tablet users describe themselves as people who follow news "all or most of the time," versus more occasional news consumers (18% follow news "just some of the time," and 9% follow it "now and then"). This outpaces U.S. adults overall, among whom 56% follow news all the time, and a quarter just some of the time, according to a separate Pew Research survey from 2010. One reason early tablet adopters may have integrated the devices so significantly into their daily lives is tied to the demographic profile of the tablet-owning population. 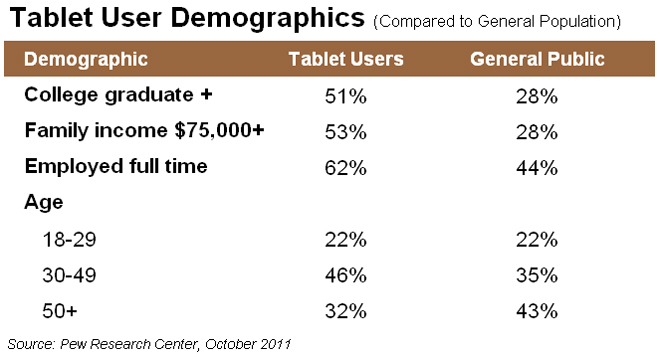 Tablet users tend to be more highly educated and have a higher household income than U.S. adults overall. In addition, more tablet users are in their 30s and 40s than the public overall, and they are more likely to be employed full time. The study reveals that, while about two-thirds of tablet news users have a news app on their tablet, the browser, carried over from the desktop experience, is still the more popular means of consuming news. A plurality of tablet news users say they get their news mainly through a web browser. Another 31% use news apps and the browser equally, while fewer get their news primarily through apps. Whether people will pay for content, though, still appears to be a challenge, says the report, even on the tablet. Just 14% of these tablet news users have paid directly for news content on their tablets. Another 23%, though, have a subscription to a print newspaper or magazine that they say includes digital access. Thus, the percent of these early tablet news users who have paid either directly or indirectly for news on their tablet may be closer to a third. Still, a large majority of those who have not paid directly for news on their tablet remains reluctant to do so, even if that was the only way to get news from their favorite sources. Nearly two-thirds of tablet users turn to the Internet for most of their news about national and international issues. That is a full 20 percentage points more than the population overall (43%), according to a 2011 survey by the Pew Research Center. But the tablet population is not anti-print. Close to half of these tablet users subscribe to a print newspaper or magazine. Cost to access news on their tablet is a factor, even among this heavy news-consuming population. Of those who haven't paid directly, just 21% say they would be willing to spend $5 per month if that were the only way to access their favorite source on the tablet. And of those who have news apps, fully 83% say that being free or low cost was a major factor in their decision about what to download. An app coming from "a news organization I like" is as prevalent a factor in the decision to download an app as is low cost. Liking the news organization is a major factor for 84% of those who have apps. And, 81% of those who went through their browser accessed news headlines via a direct news website, compared with 68% who went through a search engine and 35% that went through a social network. 90% of tablet news users now consume news on the tablet that they used to get access in other ways. 80% of tablet news users say they now get news on their tablet that they used to get online from their laptop or desktop computer. 59% of respondents say the tablet takes the place of what they used to get from a print newspaper or magazine, and 57% say as a substitute for television news. 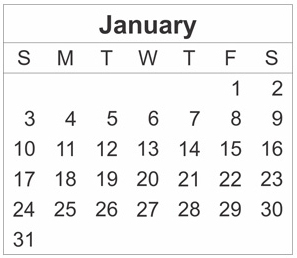 88% of those who read long articles in the last seven days ended up reading articles they were not initially seeking. In addition, 41% went back and read past articles or saved articles for future reading. Close to half of the app users say they now spend more time getting news than they did before they had their tablet (43%). That is more than twice the rate of those who mainly go through a browser (19%). App users are also more than three times as likely as browser news users to regularly get news from new sources they did not turn to before they had their tablet. 85% of those who get news on their tablets said they had talked with someone about a long article they had read there. This is more than twice the percentage who say they had shared articles electronically. Some 41% of tablet news users say they share news through email or social networking at least sometimes. For additional details and information about the study, please visit the Pew Research Center's Project for Excellence in Journalism here. Verified's Audit Reports and Publisher's Statements may include a circulation area map. This map is a graphic presentation of a publication's distribution area. Maps should be submitted electronically in .jpg, .pdf, .eps or .tif format sized to 7" X 9." A bold, clear graphic presentation yields the best results. Outline your circulation area, note the ZIP/Postal Codes and include your logo. The map should not include any circulation figures or circulation claims. A publication's logo is included on the Audit Report. The logo should be submitted electronically in .jpg, .pdf, .eps or .tif format. For best resolution, the minimum dpi is 600. The logo can be black and white or color. A brief description of your publication is included in the Audit Report. The description can include the publication's content, focus, audience, distribution method, mission statement, etc. The publication description should be 100 words or less. If you have questions regarding maps, logos or publication descriptions, please contact Verified at 415-461-6006.